(WP) – Under pressure from agriculture industry lobbyists and lawmakers from agricultural states, the Environmental Protection Agency wants to drop requirements that factory farms report their emissions of toxic gases, despite findings by the agency’s scientists that the gases pose a health threat. Under an EPA proposal, large farms would no longer have to report emissions of toxic gases from animal waste. The EPA acknowledges that the emissions can pose a threat to people living and working nearby, but it says local emergency responders don’t use the reports, making them unnecessary. But local air-quality agencies, environmental groups and lawmakers who oppose the rule change say the reports are one of the few tools rural communities have for holding large livestock operations accountable for the pollution they produce. Opponents of the rule change say agriculture lobbyists orchestrated a campaign to convince the EPA that the reports are not useful and misrepresented the effort as reflecting the views of local officials. They say the plan to drop the reporting requirement is emblematic of a broader effort by the Bush-era EPA to roll back federal pollution rules. “One of the running themes we have seen is they have taken numerous industry-friendly actions that are shot down in the courts, but they buy time for industry” in appeals and reviews that could extend years into the next administration, said Frank O’Donnell, president of Clean Air Watch, a nonprofit environmental group based in Washington. The EPA requirement that farms report large emissions of ammonia and hydrogen sulfide from animal manure has been on the books since the 1980s. The EPA does not set limits for the releases; it merely requires that farms disclose emissions over certain levels. Local public health officials say that if people in an area started getting sick with symptoms pointing to emissions, knowing who was reporting big releases of the gases would be most helpful. The EPA proposed dropping the farm emissions reporting requirement in the aftermath of lawsuits brought by communities against several big farms sought damages and stricter controls of emissions. The livestock industry has lobbied for years for the rule change. The EPA posted the proposal in the Federal Register while Congress — which is deeply divided on the issue — was on its December holiday recess. The change would take effect in October. The rule change would eliminate ammonia emissions reporting for big animal-feeding operations such as Threemile Canyon Farms in Boardman, Ore., where waste from tens of thousands of dairy cows releases more than 15,000 pounds of ammonia into the atmosphere each day, according to the EPA. 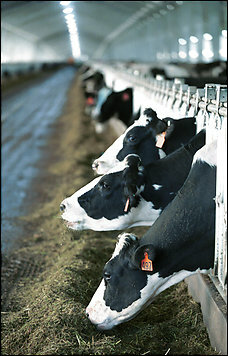 The agency estimates that livestock operations generate two-thirds of the ammonia emissions reported in the nation. The National Association of Clean Air Agencies blames manure-pit emissions containing hydrogen sulfide and ammonia for the deaths of at least two dozen people working or living near the operations in the Midwest over the past three decades. In a petition hand-delivered to Johnson in 2005, however, the National Chicken Council, the U.S. Poultry & Egg Association and the National Turkey Federation called the ammonia reporting rule “inappropriate, unwise public policy, which does not reflect the nature of poultry management practices, and does not improve environmental or public health outcomes in any way.” The groups also said the reports put farms at risk for lawsuits. Lawmakers from farm states have repeatedly tried to attach provisions exempting farms from emissions reporting. Last March, House Agriculture Committee Chairman Collin C. Peterson (D-Minn.) and more than 130 lawmakers from agricultural states sponsored a bill that would delist manure as an environmental pollutant under the Superfund law. The measure came after the cities of Waco, Tex., and Tulsa, Okla., and the state of Oklahoma filed lawsuits charging factory farms nearby with polluting water sources. One point of contention in the dispute involves a conference call with state and local air pollution control agencies, organized by the EPA in the fall of 2006, that discussed lifting the reporting requirements. Becker of the National Association of Clean Air Agencies said that in the call, the association’s members told the EPA that the health risks posed by the emissions argued against a blanket exemption. On Dec. 28, with Congress away for the holidays, the EPA published a notice in the Federal Register of its plan to proceed with the rule change. The public comment period ends March 28.